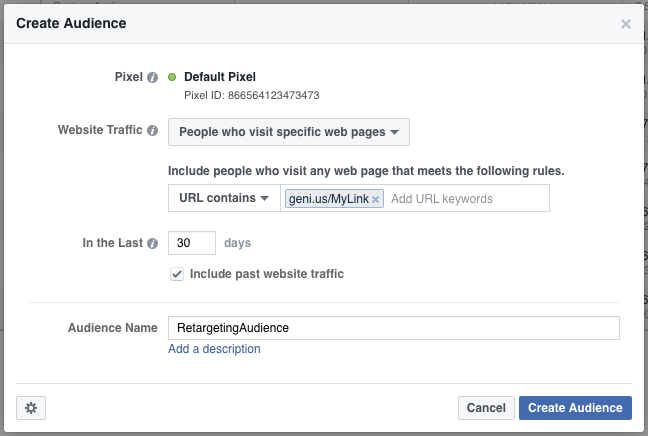 The Facebook Pixel allows you to create Custom Audiences to retarget people who click on your pixeled geni.us links. This means that you can create more targeted campaigns around the items you're promoting by advertising directly to parties who were previously interested in the same, or similar products. For example - If you promote Game of Thrones Season 1 on iTunes, Amazon, and Google Play through a geni.us link, you could pixel that link and create an audience for anyone who clicks. Then, as new seasons become available to stream, you could use that Custom Audience to specifically target users who previously clicked on the first season. This gives you the advantage of only advertising to people who have already shown interest in your promotions, leading to a higher chance of a repeat purchase. Note: For Custom Audience pixels, you'll need to create the geni.us link first, then note what the URL is (i.e. geni.us/MyLink). You'll be required to add that URL into your Custom Audience pixel setup. 1. 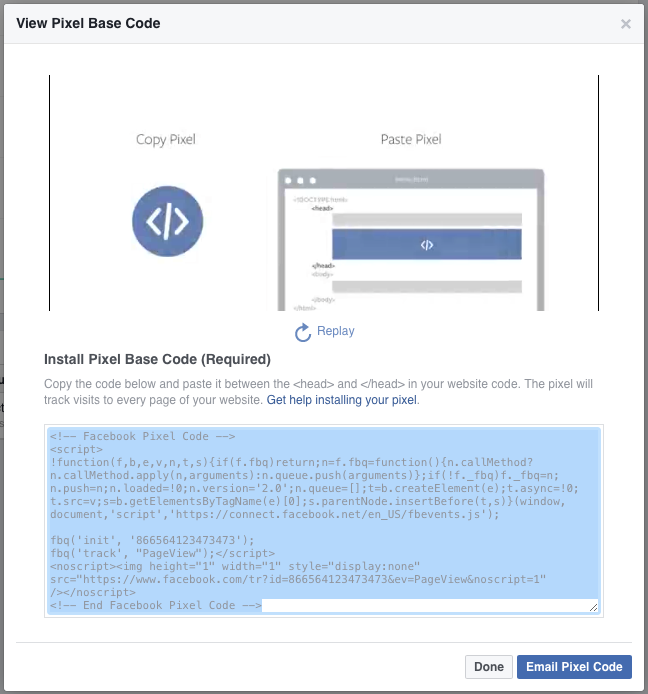 Log into your Facebook account and go to Ads Manager. 2. Click on the Tools menu in the upper left of your screen. 3. Next click on "Pixels." Note: you may need to select "All Tools" to see the Pixels option. 4. On the next screen, click "View Pixel Code"
Follow this link for instructions on how to add the pixel code to your Genius Link dashboard! 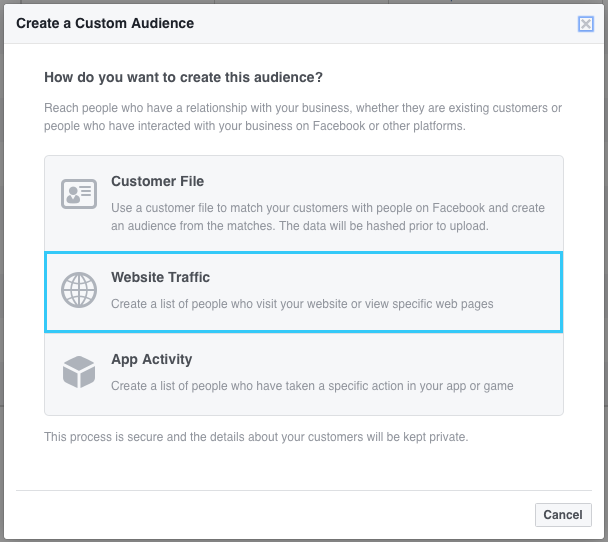 How to create a Facebook Custom Audience from your pixel geni.us links. 1. Once you have added your pixel to your geni.us links, it is now time to create a custom audience. Return to Ads Manager, but this time select "Audiences" from the tools menu. 2. From the Audiences page, select "Create Audience" and then "Custom Audience." 3. From the Custom Audience page, select "Website Traffic." 4. On the next screen, choose "People who visit specific pages." 5. For the field "URL contains" insert your geni.us link URL that you want to track. Note: If you want to track all geni.us links that you create with the same pixel, you can simply use "geni.us" instead of an individual link. 6. Be sure to give your Audience a name, then click Create Audience. That's it! Now as people click on your geni.us link, they will be automatically added to this Custom Audience so you can retarget them later on.